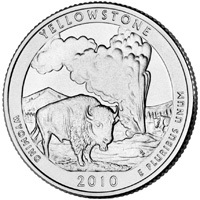 The Yellowstone National Park Quarter is the second of 2010 and the second overall in the America the Beautiful Quarters™ Program. First established as a national site on March 1, 1872 (17 Stat. 32), Yellowstone National Park is home to a large variety of wildlife, including grizzly bears, wolves, bison and elk. Preserved within the park are Old Faithful and a collection of the world's most extraordinary geysers. The reverse image features the Old Faithful geyser with a mature bull bison in the foreground. Inscriptions are YELLOWSTONE, WYOMING, 2010 and E PLURIBUS UNUM. Design candidates were developed in consultation with representatives of Yellowstone National Park.